The Vancouver Condo Buzz » SPECTACULAR Vancouver Kensington Gardens Condos by Westbank Previewing Fall 2013! 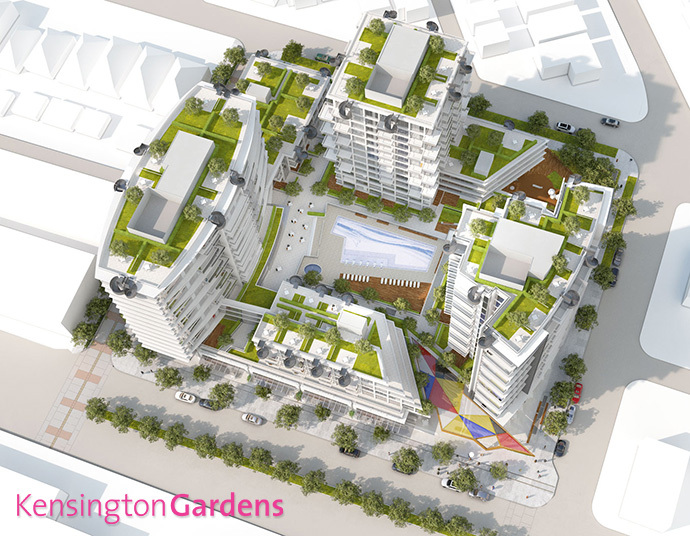 3 Uniquely Designed High-Rises, Townhomes, Podium Apartments & Penthouses for sale at Kensington Gardens Vancouver Master Planned Community! REGISTER NOW! « From $268k! Landmark Vancouver TATE ON HOWE Condo Tower in Downtown South (1265 Howe Street Vancouver) > 41 Storeys of Exclusive TATE Vancouver Condos + 17 Artist Studios! North America’s leading residential developer is bringing the first fantastically designed and executed project to this community, and it is surprisingly affordable. Coming Fall 2013. 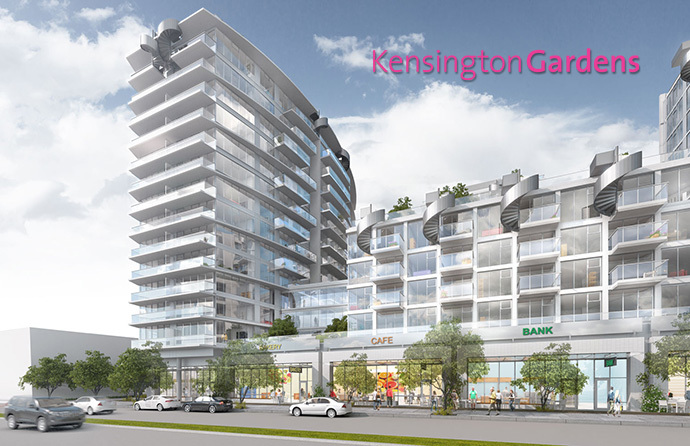 The Kensington Gardens Vancouver condo project is brought to you by Westbank and located at 2220 Kingsway Vancouver. This new and very exciting integrated transit oriented urban community will offer 3 unique residential towers, a boutique collection of walk-up townhouses, a residential podium as well as exclusive penthouse suites for sale. All of these unique home purchase opportunities are linked by an elevated landscaped courtyard, a new urban park, lane and a central plaza for all Vancouver Kensington Gardens condo owners to enjoy year round! In addition, the community will have an impeccable location close to downtown Vancouver, YVR, Richmond as well as shopping, dining, services and recreation. The new project is also considered a transit-oriented community. The presales Vancouver Kensington Gardens condos will features secured underground parking and bike storage in addition to private seasonal lap pool and hot tub. There is an impressive indoor fitness facility and multi-purpose clubhouse lounge for entertaining and relaxing. There’s also a screening room in addition to outdoor barbecue area and fireplace. Owners at the new Kensington Gardens Vancouver condos for sale can also enjoy the outdoor courtyard, lounge space, children’s area and urban orchard, a first in this city! For more information please visit www.kensingtongardens.ca for more details as they are released. Also, the architect for this amazing project is by award winning Henriquez Partners Architects. Here are some of the draft interior finishes for the new and impressive Kensington Gardens Vancouver condos by Westbank Developers located at 2220 Kingsway Street Vancouver. The homes will have custom solid wood suite entry doors and granite stone threshold. The main living spaces will feature elegant engineered wood floors in brushed oak and the private quarters like bedrooms will have high-end and comfortable carpeting. All windows will have sleek roller style shades for privacy and all homes will come standard with high-end GE front loading washer and dryer. The kitchens at Westbank Kensington Gardens Vancouver condos include German imported Nobilia cabinets, under cabinetry task lights, durable Corian counters, striking backpainted glass tiled backsplashes and stainless steel sink with chrome faucet. In addition, home owners will be delighted to have a high-end set of appliances that includes a Miele stainless steel gas cooktop, wall oven in select homes and a custom hood fan, a Blomberg fully integrated dishwasher and Blomberg built in fridge and freezer with custom panelling finishing for a truly integrated and sleek modern look and feel. There’s also a top of the line Panasonic microwave and in-sink garburator. The bathrooms at the pre-construction Vancouver Kensington Gardens Condos by Westbank will include modern chrome accessories, Nobilia vanity cabinets (like in the kitchen and imported from Germany) in addition to Duravit under mount sink designed by Philippe Starck and a Duravit 1 piece toilet also designed by Philippe Starck. Other bath features include quartz stone vanity counters and backsplash in addition to a large Acritec bath tub and tempered glass shower enclosures as per plan. The pre-construction Vancouver Kensington Gardens condos will also feature Grohe shower arm and faucet with pressure balanced valve (called the Grohsafe Universal) as well as distinctive large format porcelain tiled floors and matte glaze ceramic shower and bathroom wall tilling. Lastly, there is a custom mirrored medicine cabinet above the beautiful vanity for more storage. When it comes to master planned communities, Westbank Developers knows exactly what residents and prospective homebuyers are looking for. 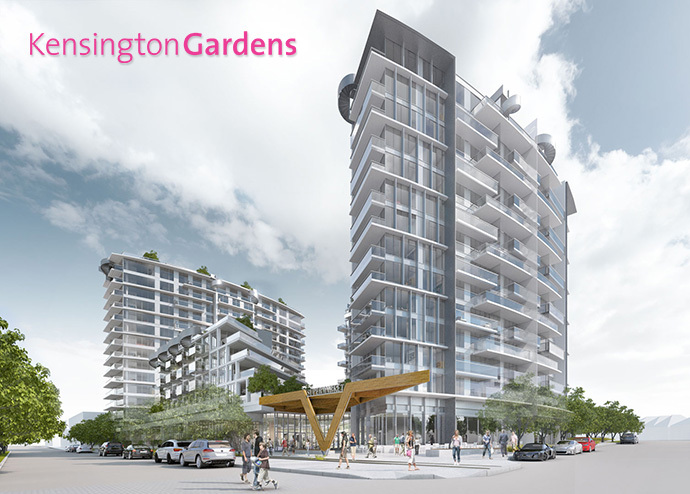 Here at Kensington Gardens Vancouver condos, owners and residents will find a wide variety of on-site urban amenity spaces that will give you space to entertain, relax, socialize and get excited about! Some of the condo building features in this masterplanned Westbank project includes: a multimedia theatre/screening room, Resident’s Lounge space, children’s playground, outdoor deck with BBQ area and outdoor fire places in addition to a full fitness centre. Some of the other amenities for you to enjoy at the presale Vancouver Kensington Gardens condos includes a swimming pool, hot tub, sauna and steam room. Outdoors, homeowners will find a beautiful urban orchard in addition to an elevated garden courtyard. As part of the master plan, the developer will also incorporate a large supermarket/grocer in addition to a premiere Asian style restaurant on-site. There will also be plenty of space for new boutique retail stores as well as services, so everything is literally within walking distance from your front door. 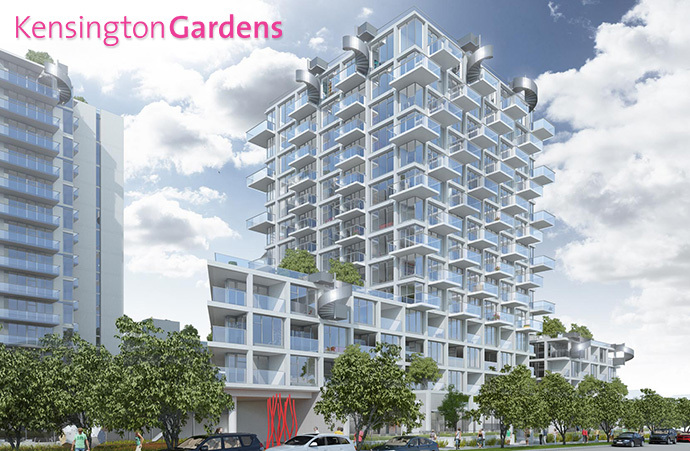 Other presale Vancouver Kensington Gardens Westbank condo community features include a green roof, public art stations, an Asian-inspired park/green space and a landmark plaza. All of these on-site amenities are outstanding. Everything you need for a hotel quality style living space is right here at home. An impressive array of private residential amenities have been designed for your personal use, healthy and enjoyment! These 5 star amenities are not found anywhere else. In addition, the project site is located at 2220 Kingsway Street Vancouver Kensington Gardens condos are between Nanaimo and Victoria Street, which means that residents are also within easy walking distance to eclectic boutique retail, big box retailers, mass transit systems, major thoroughfares as well as local services, restaurants and shopping. Welcome to the new heart of Vancouver real estate. This is the ultimate Vancouver address at an incredible value! 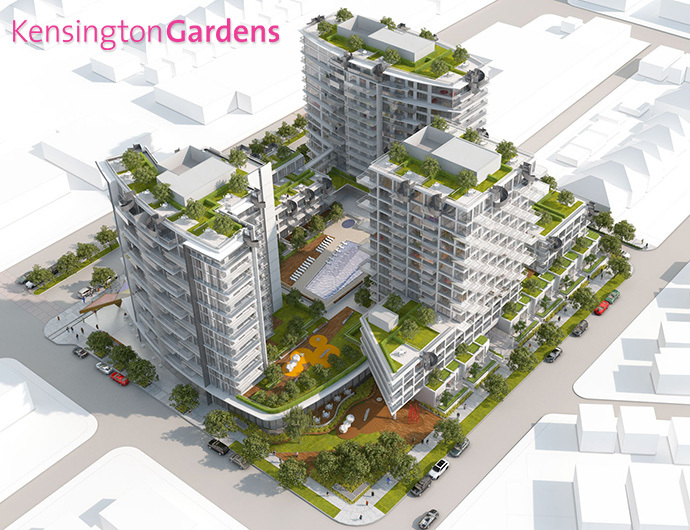 Kensington Gardens is a landmark condo community by Westbank in Vancouver.